We are Award winning and pioneer Institute in Mathematics and Statistics providing preparatory guidance to the higher education students who wanted to join IIT for MSc & PhD and Civil Services. Students who wanted to clear exam like IIT JAM, CSIR NET, UPSC IAS, join us for high quality education and guidance. 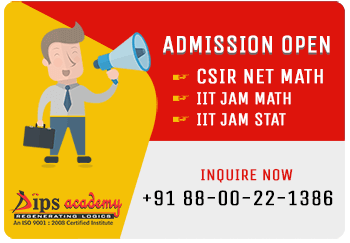 We are conducting classes for IIT JAM in two subject that is Mathematics and Statistics. Students who wanted to appear in IIT JAM Mathematics and IIT JAM Statistics join us. CSIR NET Mathematics is another flagship program for which students trust us for better guidance. Keeping quality in mind and demand in market, we had done research for creating better curriculum for UPSC IAS Math Mains. Being undisputed leader in Mathematics, civil service aspirants join us for UPSC IAS Math program. It satisfy the students what exactly they need for preparation of UPSC IAS which is a very niche area and demand specific. We have dedicated in-house R&D team that keep doing research and developing new pedagogy, study material, online test series and various assignments. Team is putting continuous effort for regular updating the study material so that contemporary syllabus be covered nicely and effectively. We have our own publication house as well that publishes various books related to the subject and programs.